Mighty Vapors Nic Salt - Frozen Mystery Pop 30mLWhat’s in the bottle?! Whatever it is, it’s made wit.. Mighty Vapors Nic Salt - Mystery Pop 30mLWhat’s in the bottle?! Whatever it is, it’s made with high .. Mighty Vapors Nic Salt - Frozen Majestic Mango 30mLA superior blend of succulent mango nec.. Mighty Vapors Nic Salt - Majestic Mango 30mLA superior blend of succulent mango nectar mad.. 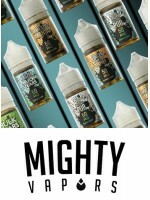 Mighty Vapors Nic Salt - Frozen Hulk Tears 30mLOur famous sour watermelon apple candy with.. Mighty Vapors Nic Salt - Hulk Tears 30mLOur famous watermelon apple candy with a dash of b..